My husband and I are huge fans of Kettle Chips. They are perfectly crispy, salty, and flavorful. I love every flavor but the sweet onion are probably my favorite. Last year, I did a review of the sweet onion and fully loaded baked potato chips. I loved both of those and emailed the company to review their chips again. The company sent me some chips from their new reduced fat line. Of course I like to indulge on foods like chips but love when I find a lower fat product that tastes good. I was sent some of their sea salt, salt and fresh ground pepper, and sea salt and vinegar chips. My favorite are the sea salt and vinegar. They have 40% less fat than the regular chips. The serving size is a typical 1 ounce serving which has 130 calories. This is about 20 or so less than many regular kettle chips. Each serving has 6 grams of fat, 240 mg sodium, and 2 grams of protein. 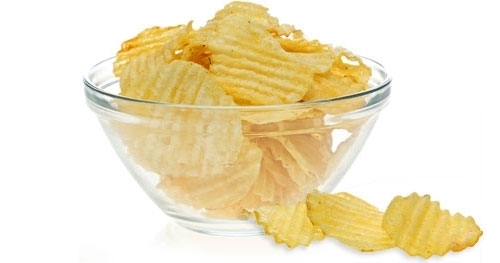 They are krinkle cut and much thicker than many other chips. The only thing that I didn't really like about them is that were not that sour. In most salt and vinegar chips, I appreciate the sour flavor and these didn't have quite enough. Overall though, I love this brand of chips and purchase them in the grocery store often. Although I can't say I've tried the sea salt and vinegar before. Maybe our next grocery trip we'll give it a go! I love salt & vinegar chips - especially kettle...I will have to be on the lookout for these.